The Hundred Foot Journey captures the rise of Indian influence in the world’s culture. When an Indian family opens a restaurant across the street from her Michelin-starred restaurant in a village in France, Madam Mallory (Helen Mirren) disdainfully dismisses the food of these invaders– it’s much too spicy, she says. The movie is about a difficult courtship between the two worlds. Madame Mallory and Papa (Om Puri) are mostly disinterested in getting to know each other at the beginning of the film, their relationship quickly devolves into war. But their coexistence inevitably pushes them together. 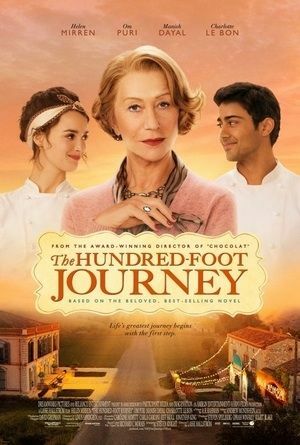 The journey in The Hundred Foot Journey is about Madam Mallery’s journey toward accepting and embracing her new neighbors, and also about this Indian family’s reciprocal journey. As a film about Indian food, I found the details to be all too real. A number of times when I’ve cooked with Puja, I’ve complained to her, “you need to be beat over the head with a hammer by the spices.” She has made this into a point she repeats with pride. Like Puja, Hassan (Manish Dayal) struggles with the spicy tradition of his roots, and works to find a way to integrate that into all of his cooking in order to stay true to himself. Hassan takes quite readily to the more subtle French style of cooking, his passion for cooking, and perhaps his youth, make him open to the flavors and possibilities he is shown when introduced to this new way of cooking. But he achieves true mastery only when he ultimately he learns to integrate the two traditions. The two performances that really stood out for me in the film were Om Puri’s as Papa and Charlotte Le Bon as Marguerite. Om Puri is, of course, a well-tested veteran actor. His performance is no more surprising than Helen Mirren’s, simply because they are both masters of their craft. But in The Hundred Foot Journey, his chops are really put on display. He provides some of the most comedic moments as evident in the trailers, as well as the most heartwarming. Even though the film is centered around the struggles and successes of Hassan, each of these moments are reflected back to us in his father. His father struggles to set his family on the right path. When Hassan succeeds, Papa sees how it hurts the family, but accedes as he must to the need for Hassan to grow. Charlotte Le Bon was also captivating, like Juliette Binoche in The Unbearable Lightness of Being, or of Audrey Tautou in Amelie. The exuberance and flirtiness of a young French woman is essentially a stereotype, but like Binoche and Tautou, Le Bon has taken her character well beyond that one dimension. Marguerite comes to like Hassan very much, very quickly. It isn’t exactly clear why she holds back in the beginning, other than some half-hearted professional rivalry. But later on she struggles with her own genuine jealousies. She is deeply ambitious but doesn’t quite have the talent that Hassan does. Her food is not nearly as inspired. She is torn between her jealousy of Hassan and her excitement for him. She wants to be happy for Hassan but in this cutthroat business she can’t help suspecting he has taken advantage of her kindness. Ultimately Hassan has to find his voice in the spices of his home. A point that is thankfully not pushed too hard. That is a balancing act the movie gets right over and over again. Hassan manages to keep his head above the rancor in a way that keeps the movie from becoming too sentimental. Even when Marguerite is accusing him of trickery, his affable and genuine nature make it difficult for her to mistrust him for long. As it must be in a movie like this, that is, one that is a bit of a travel movie in disguise, the photography was beautiful. It is not shy of the wide shots to show off the lush landscapes of this French village. You could freeze the movie at nearly any of these moments and have a beautiful landscape photograph that could be framed and hung on a wall. The score is by A. R. Rahman, considered India’s best living Bollywood composer. He is best known in the U.S. for his score of Slumdog Millionaire. I found his score in The Hundred Foot Journey to be really effective. It was an Indian score, but it was never overbearing. He even shows restraint when Madame Mallory complains about the volume of the music, perhaps in that case a little too much. This was produced by Oprah Winfrey (and Stephen Spielberg). For some reason, seeing her name attached to a movie made me fearful the movie will be some sort of saccharine sweet feel-good cliched, Hallmark channel type movie. But that is unfair– obviously unfair. Oprah doesn’t get involved with a lot of movies but the ones she has been involved with are decidedly not puff, like Precious and Beloved. Oprah seems to have caught on to the growing influence of India in the overall world culture. She and I seem to agree on this point, and The Hundred Foot Journey couldn’t be more timely. There is an important theme to this movie about accepting immigrants and the influences of other cultures. Historically, cultures have always managed to intertwine naturally with time, but it has tended to involve a senseless amount of violence in the process. I think movies like this have the opportunity to expose the more fearful minded people in a soft way to the foreign culture, and to prepare them for acceptance. The last major motion picture about Indian culture was The Grand Exotic Marigold Hotel, which came out in 2012 and grossed $136 million in the U.S. alone (from a $10 million budget) and will have a sequel released next March. The mere fact that these movies are being created to great profit, seems to show, in an economic way, the world is ready for India. Movie Review: Well Done Abba! Comments on "The Hundred Foot Journey (Movie Review)"